Tonight, the Minnesota Twins lost their second game of the American League Division Series to the New York Yankees. The Series will head back to New York for game 3 of the series on Saturday. In mourning of their World Series hopes for yet another year, let me give you guys a little history lesson. The Twins are a member of the American League Central, which they have won six times. The Twins have also won 6 American league Pennants, and have won the World Series in three of those seasons. The Twins have been in Minnesota since the 1961 season, and have played in three separate ball parks; Metropolitan Stadium, then the Hubert H. Humphrey Metrodome, and now at Target Field just down the street. Some notable Twins legends are Rod Carew, Harmon Killebrew, Kirby Puckett, and even Walter Johnson when the team was based in Washington, D.C. and known as the Senators. 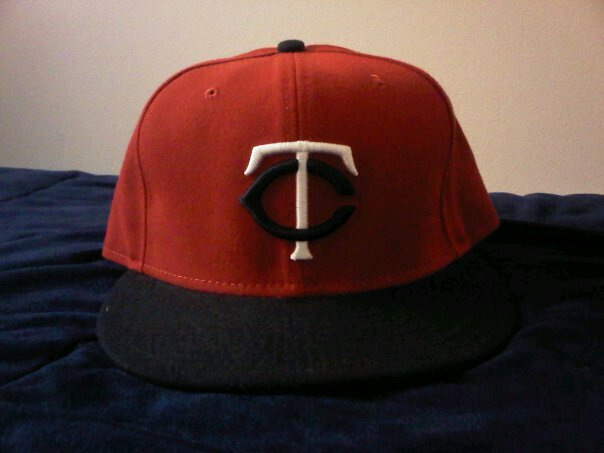 The cap in the picture, which I found in The Mall of America last summer, has a red crown, navy blue brim, and In interlocking T and C for twin cities (Minnesota and St. Paul) respectively in blue and white. This cap, along with other twins caps, can be found on the Twins shop web site which I've linked below. Good Try Minnesota, get you 9 iron out, Tee Time is at 8:45 Sunday morning.